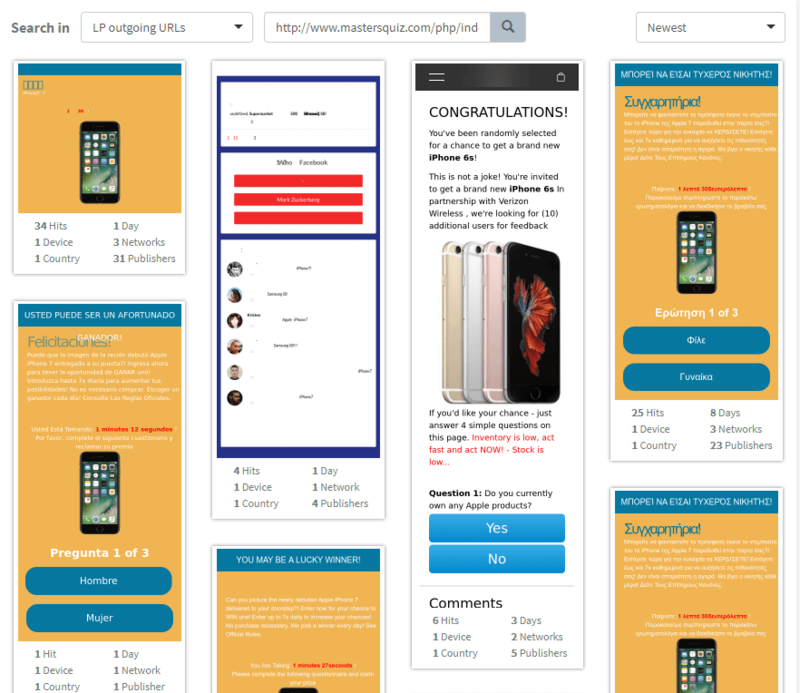 AdPlexity is a competitive intelligence tool for mobile, native and adult ads. Having a competitive intelligence tool is extremely important in this industry. Being able to see what your competition is doing extremely valuable. Post Bonus: Click Here To Get 30% Off Adplexity For Life! They were known as wall hacks & map hacks. By seeing what your opponent is currently doing allows you to react much differently than if you were going in blind. The same is true when using AdPlexity. Knowing the exact landing pages, offers and even traffic sources that your competition is running allows you to easily clone all their past efforts and eventually +1 them. Not a day goes by without someone asking me which offer & traffic source they should run. Always believe we have some magic angle or landing page that no one else has thought of.. In reality though, chances are you’re not the first one to have thought of a particular angle or landing page style. The reason all of your competition is running the same landing pages on the same traffic sources is simple… THEY WORK. Even though AdPlexity does allow you to rip your competitors creatives and even placement IDs, chances are your campaign will initially fail. Knowing this when launching a campaign is important. As I’ve said so many times before data cost money and data is what separates a successful campaign from a failure. However, if you plan on having success with this particular campaign, you have to start as close to your competitors as possible. By doing this, it allows you to get a baseline of your competitors KPIs such as banner & landing page CTR and even conversion rate. Once you have a baseline of their creatives, you can start testing your own changes to see if they are in fact better than the competition. Let’s go ahead and dive into AdPlexity and see the best ways to make use of the tools. When you first login to AdPlexity, you’ll see a dashboard similar to this. If you do the same keyword seraches over and over, I suggest you save them. This drop down will allow you to easily search through your various queries quickly. The filter allows you to narrow down your results based on various metrics. Such as days running, ad type, device type, size, country, language connection, traffic source, affiliate network and even tracker used. This top menu allows you to select what you want to search by. The default is keyword, but you can also search by advertiser, publisher, and even placement. 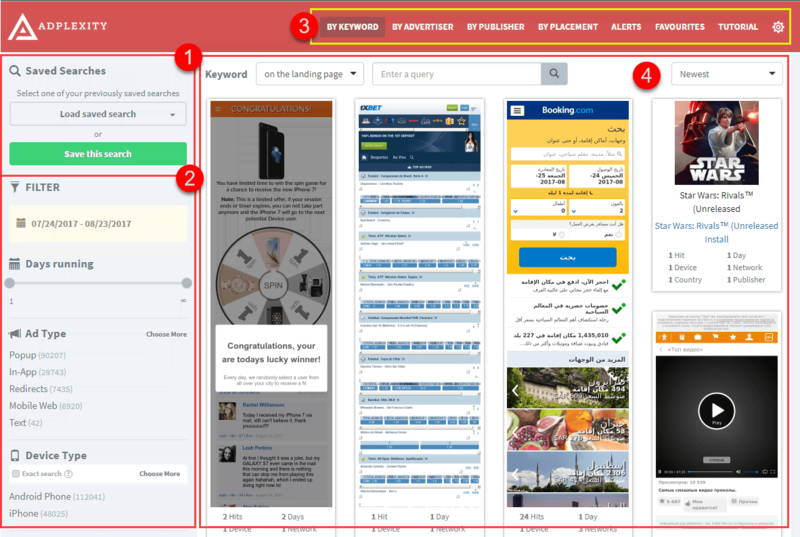 After making adjustments to your search & filters you’ll see the results update in real time. Now that you know the bare minimum of AdPlexity, before we go any further, you must determine what your goals are for spying. If you are brand new to a particular country, vertical it’s important to get a feel for what has been working for the long term. In this example we’ll research Spain Sweepstakes offers. By default last 30 days are selected. Use this to set your own custom date range. First we’ll want to see what has been running for the “long term”. I like to select Days running to be a minimum of 60 days. Once again this is just to get a feel for what has been running long term. Once you collect data on campaigns that have been around a while, you can then start to sort campaigns that have been running for 1 – 2 weeks to get a better feel for what is working right now. We will also want to select Spain under the country selection. Now under keyword we’ll want to put things such as iPhone, Voucher, etc to see which type of landing pages have been running for at least 60 days. As you can see there is a landing page that is being ran by over 1,500 publishers and has been seen for 97 days straight. What we will want to do now, is click on one of them to bring up the stats of that particular page. We now have a dashboard showing us a ton of stats for just this particular landing page. This is a thumbnail of the landing page, but if you hover over it and click the star button, you can add this landing page to your favorites. We can see that this landing page has been spotted in Spain, Chile & Argentina. This landing page is also being used on all carriers including wifi. Shows us the URLs of where this page was found. If we click on show more on one of the links, it’ll bring up yet another box showing us even more details about the page. We can see that this particular Advertiser is using the Voluum tracker. For those of you that are not that great in HTML, making sure the the advertiser is using the same tracker as you can save you some headache. We can also see the under Affliate Networks it says none. This means that it’s possible that this particular landing + offer combo is an in-house media team or an affiliate running direct. This is the redirect chain, a lot of times you’ll see their primary tracking url which then redirects to where their landing page is hosted. Outgoing URLs is where this landing page is sending the visitor to once they click the CTA. This is helpful because you can see exactly which offer is being ran with this landing page. You can take this link to your affiliate manager and ask if they have this particular offer. If you’d like to download all the source code of this particular landing page, you can do so by clicking here. Now that we know which offer and landing page has been ran for 60 days, lets go close that window and go back to the data page of this particular landing page. First up we have Ad trend. This shows us visually how many times this particular landing page has been seen. For the most part it’s been pretty stable, besides disappearing for a week between July 19th and July 26th. If we scroll down further, we see a Week Trend. It appears that this landing page has been running pretty steady throughout the week. 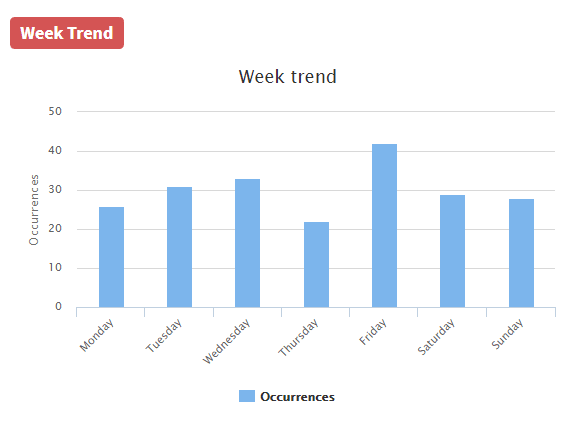 What this tells us is that the landing page doesn’t only work on the weekend but is being ran constantly. 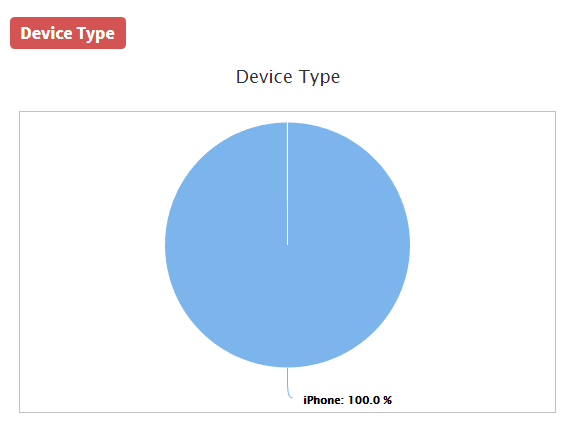 AdPlexity is also giving us some valuable data right here, it’s showing that this landing page is only being ran on iPhone traffic. 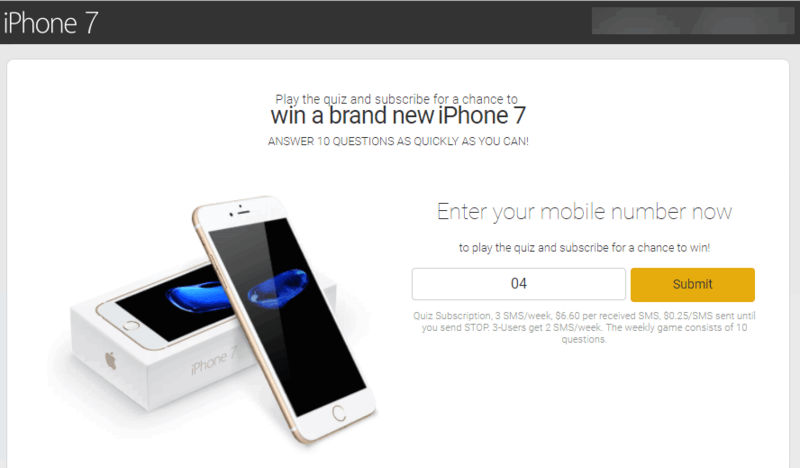 If we decided to go test this landing page, you best believethat I would first test a campaign targeting only iPhone traffic. 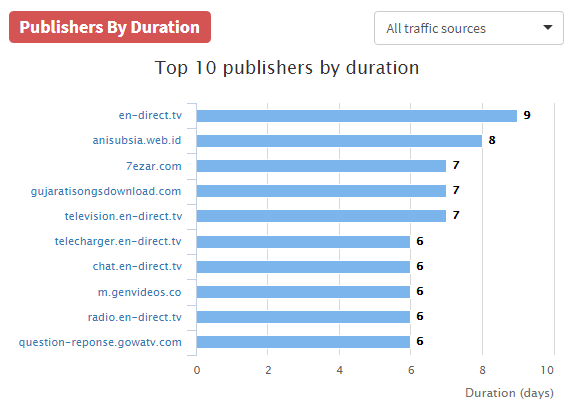 We can also see which publishers (placements) the landing page is being ran on and how long it’s been ran on each one. Now yes, this data does tell us that this landing page has been seen for 9 days on en-direct.tv which is a good indicator that it’s profitable. However, what I really like about this top 10 list is almost all of the URLs are TV related, most of which are sub-domains of en-direct.tv. 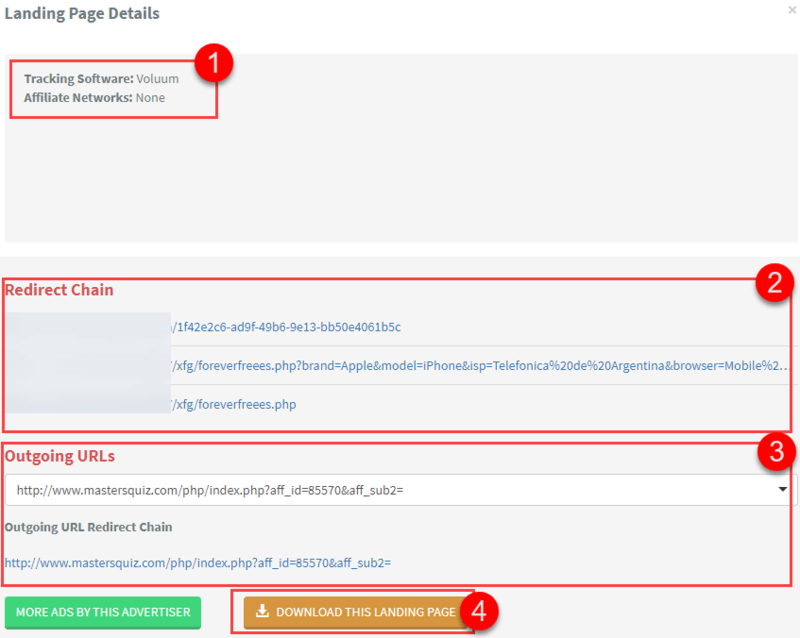 By using the traffic source drop down in the top right, we can see that this particular publisher can be found on AdCash. Next to Publisher Duration is Publishers By Volume. I haven’t found to much use for this, as the data isn’t really correct. Basically this is a break down of the top 10 decided by how often the page has been seen. This is a new feature that AdPlexity recently released on June 21st. I’m pretty excited about this feature as they can do a lot with it. If you want to know the Publisher URL and which Traffic Source the ID is for, simply hover over the ID to get more details. I would suggest creating a campaign with just these placment IDs to see the conversion rate they generate. 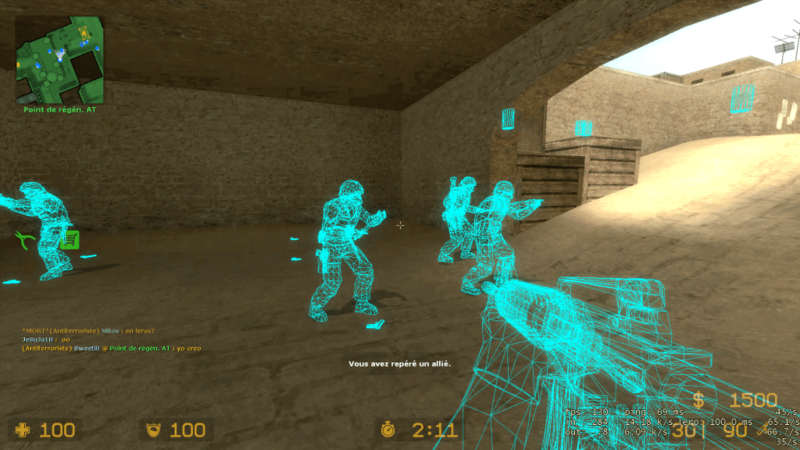 This is a new feature that AdPlexity released along side placement ID duration. 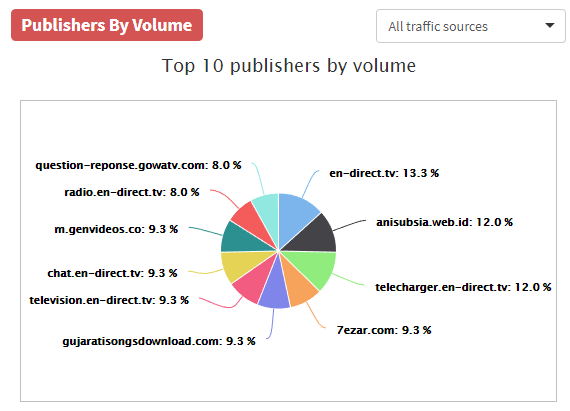 However, much like the Publisher volume pie chart, I don’t see much use for this data currently. 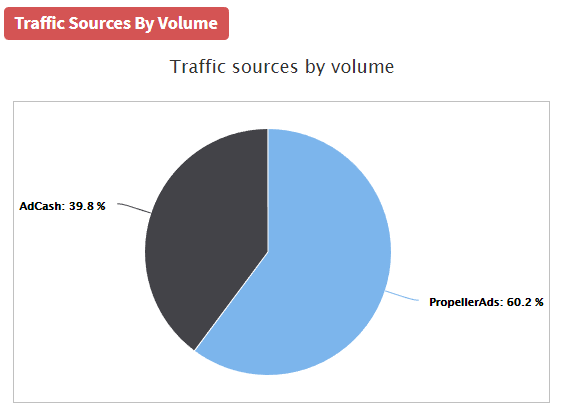 AdPlexity, provides us data on which traffic sources this landing page has been found and how many days it’s been running. 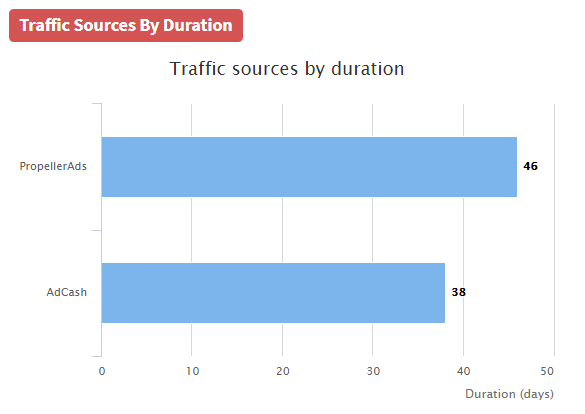 We already knew which traffic sources it was being ran on by the drop downs on other info boxes, however knowing how long this campaign has been ran on these sources is a good indicator that it’s working very well. 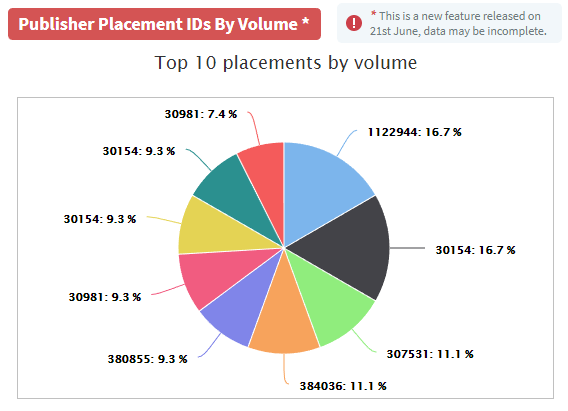 Much like all the other AdPlexity pie charts, this data is kind of useless. So take this data with a grain of salt. Another way I like to use AdPlexity is by plugging in my offer url to see what my competitors are running. The first thing you will need to get a hold of, is the actual landing page URL of your offer. Some Affiliate Networks and Advertisers block the actual landing page by redirecting traffic that will never convert on the offer IE you. To get around this you can either ask your affiliate manager for the landing page url of the offer or use a VPN to try and get past any geo blocks. Say we were wanting to get more data on this offer. First click on By Advertiser in the top menu. 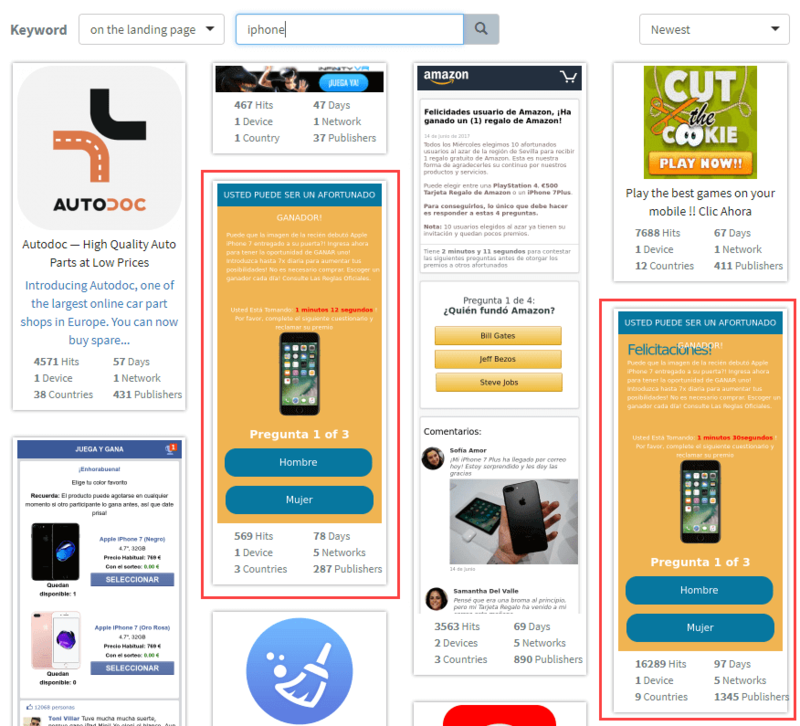 You can now see all the landing pages that are being ran with your offer. As you can see our faithful “Yellow lander” is popping up quite frequently. Alerts or monitoring tool will notify you each time new ad with the domain you are monitoring appears in the system. If you are doing same searches every day (for example; you are looking for Popups and Redirects in DE, CH & AT which are running on PopAds and ZeroPark for atleast 7 days) – Use this to save search configuration, so you don’t have to select all options/filters next time over again.